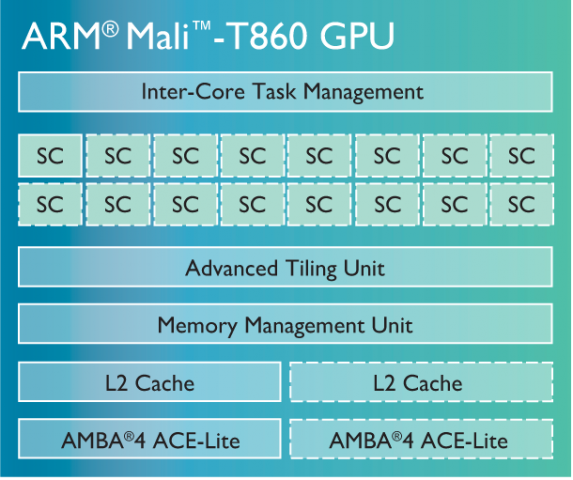 The ARM Mali-T860 MP2 is a mobile graphics solution that can be found in ARM SoCs like the Mediatek Helio P10. The chip is available since Q1/2015 and supports OpenGL ES 3.1, OpenCL 1.2 and DirectX 11.1. The Mali-T860 can be built with 1 to 16 clusters, where the MP2 version features 2 clusters/cores. The MP2 version is used e.g. in the Mediatek Helio P10 at 700 MHz and performs similar to a Adreno 405 or Mali-T628 with a low core count (e.g. MP2 or MP4). Therfore, only low demanding gaming are suited for the GPU. In the Helio P10 the GPU is manufactured in 28nm at TSMC.